Lufthansa, the German flagship carrier, announced Monday that it would cease its business operations almost completely by cancelling 3,800 flights scheduled for the three days. The strike, called by the German pilots union Vereinigung Cockpit (VC), has been planned for the period from Wednesday to Friday. The all-out strike is intended to increase pressure on the Lufthansa management as VC is demanding a 10 percent salary increase and the maintaining of in-house early retirement age of 55 for the 5,400 pilots. Lufthansa had planned to raise the retirement age to 60 and change the rules so that entry-level pilots begin paying a portion of the transitional retirement fund. A Lufthansa pilot was previously able to retire from age 55, with the company paying so-called transitional benefits amounting to as much as 60 percent of the last salary until the legal retirement age of 63. The spokesman in Munich airport also added that the airport has established enough cots and set up aid stations and family areas for those travelling with small children. 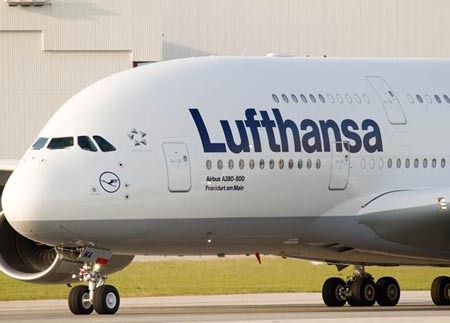 According to an estimate by Metzler analyst Juergen Pieper, Lufthansa is set to lose an operating profit of 30 to 50 million euros ($69 million) due to the strike.